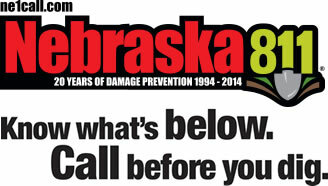 If you have a back-up in your sanitary sewer system, contact the Nebraska City Utilities by calling 873-3353. This number is staffed 24 hours per day for emergencies. 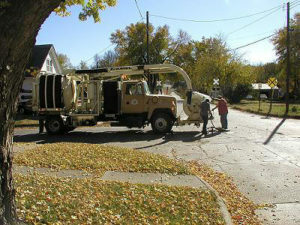 A crew will respond to check the City’s main sewer lines. If a line is found blocked, the crew will purge the line to get it open. If your back-up does not recede after the City line is found to be open or after it is purged, you should call a professional plumber to have your home’s service line cleared. The City cannot recommend plumbers for this service, but many can be found in the local telephone directory yellow pages. After City crews have inspected the main sewer lines, we will inform the customer reporting the back-up as to our findings. Please be sure to leave an accurate address and telephone number when reporting a back up. Use caution when using any electrical appliance in a wet environment. DO NOT attempt to shut off electricity, if the breaker box is wet or near any water. DO NOT use outlets that may have become wet or are near any water. Remove standing water. Heavy duty wet vacuums work well for this and may be obtained from local rental stores to assist in clean up. NOTE: Insurance liability restrictions prevent Utility crews from assisting in the clean-up of private residences and furnishings. The Utilities has little control over what is put in the sewers, therefore we can not be held responsible when improper items are put in the sewer or when heavy rainfalls surcharge the lines. We can not control these events. You may want to check with your private insurance carrier to determine if you have coverage through your homeowners insurance. Most homeowners insurance does not automatically include this coverage. Sewer blockages sometimes occur due to tree root infiltration or improper items entering the sewer line. 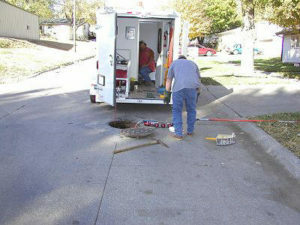 The Utilities conducts an aggressive program for removing root infiltration in the Utilities sewer system. The Utilities also recently acquired a Sewer System T.V. 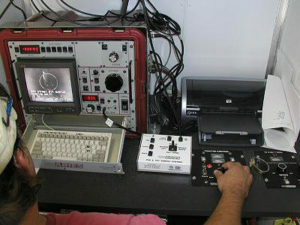 Inspection System and is in the process of TVing the sewer mains of the City during maintenance for determining possible areas of future maintenances. in advance of inspecting main with camera remotely controlled by operators. Preparing to insert TV camera into sewer main. Monitoring condition of Sewer main from inside of trailer. Recordings are made and filed for future reference. If you experience sewer gas odor, check all plumbing fixtures and drains to be certain all traps are full of water. Pour some water down floor drains or infrequently used tubs and showers to be certain traps are full. Check for cracked or broken pipe or fittings.